Background: Beta-adrenergic receptors are expressed in cardiomyocytes and activated by either noradrenaline released from sympathetic synapses or circulating catecholamines. Their corresponding receptors have three subtypes, namely, β1, β2 and β3, which are members of the G protein-coupled receptors (GPCRs) family. Activation of β1-adrenergic receptors causes various physiological reactions including cardiac contraction and renin secretion from juxtaglomerular cells of the kidney. Antagonists of β-adrenergic receptors, known as β-blockers, have been used effectively for over four decades and have beneficial effects in the treatment of cardiovascular diseases. There are three generations of β-blockers according to their pharmacological properties. Firstgeneration β-blockers are non-selective, blocking both β1- and β2-receptors; second-generation β- blockers are more cardioselective in that they are more selective for β1-receptors; and thirdgeneration β-blockers are highly selective drugs for β1-receptors. The latter also display vasodilator actions by blocking α1-adrenoreceptors and activating β3-adrenergic receptors. In addition, thirdgeneration β-blockers exhibit angiogenic, antioxidant, anti-proliferative, anti-hypertrophic and antiapoptotic activities among other effects that are still under investigation. 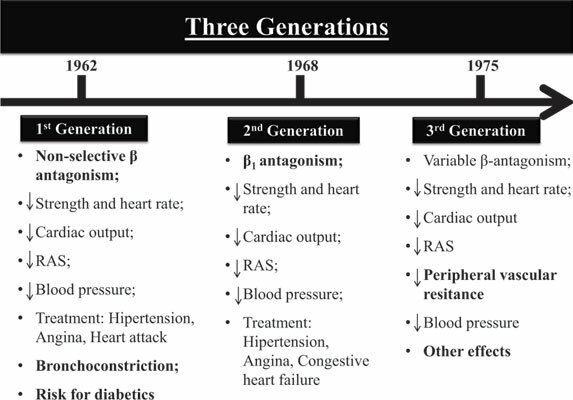 Conclusion: The objective of this review is to describe the evolution observed during the development of the three distinctive generations, thereby highlighting the advantages of third-generation β- blockers over the other two drug classes. β-blockers, antagonists, β-adrenergic receptors, cardiovascular diseases, clinical applicability, G protein–coupled receptors (GPCRs).